I am looking for a white lamb with a blue cross on the left breast by GUND DanDee. I have searched, but I have not been able to find this item. 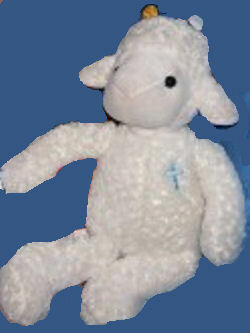 My son lost his about 2 1/2 weeks ago in Philadelphia at the Walmart and am searching for this lamb. My son is 2 years old and he knows his lamb is missing. His lamb has been with him since birth, and it means a lot to him.